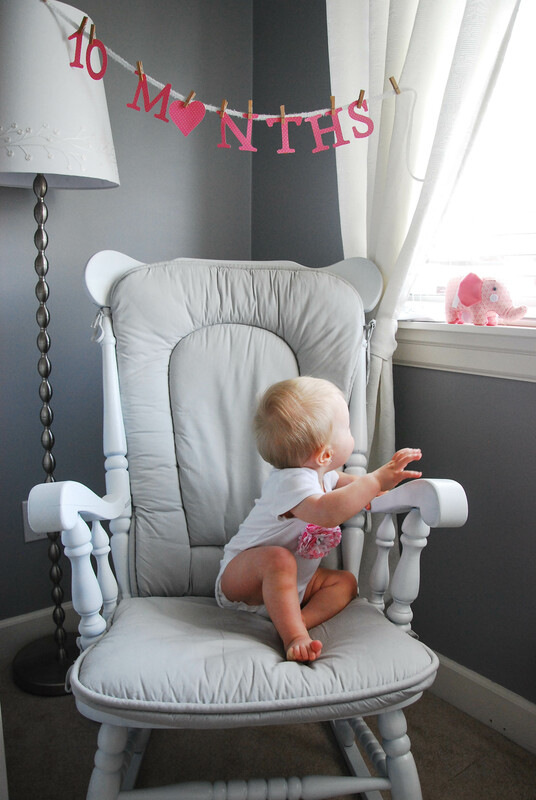 Every month I look forward to my little photo shoots, I set up the chair the same, put her in the same white onsie (we have gone up a size or two of course) and try and get one good shot. My photo shoots used to last a while and I got dozens of pictures on both our camera and my phone. This month I got a handful of good pictures on the camera and 4 blurry photos on my phone. They are also becoming trickier as she is now very mobile and getting her to sit still is impossible. I literally have 10 minutes to get the shot I need, all while using one hand to hold the camera, the other waiving a toy to get her attention and my third hand is ready in case she decides to dive out of the chair. Sorry what was that? A third hand? 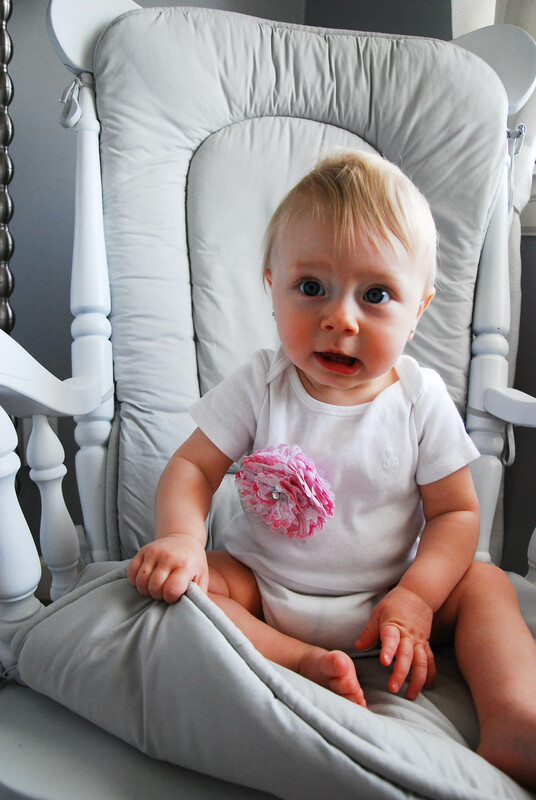 I’m a mom, multitasking is our game and yes she has dived out of the chair during one of these shoots. When baby number 2 happens I’m not 100% sure I would use the chair again, but it would be neat to see the two of them in it for comparison. 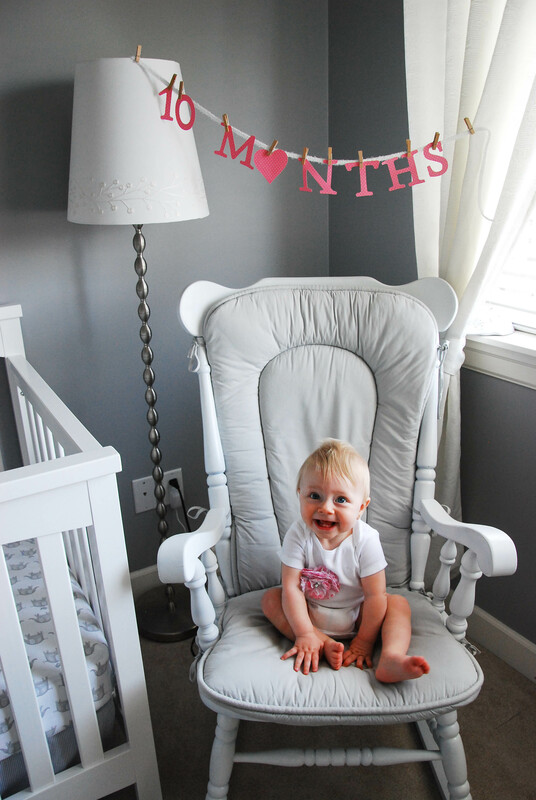 We reached double digits this month, wow, I can’t believe in only 2 months she turns 1. This girl, I don’t even know where to start, she is a busy one. Everyday we are discovering something new, this month we learned how to open cabinets. We also learned how to slam the cabinet door closed on our own arm, repeatedly 🙁 We discovered fun cabinets like the Tupperware cabinet and it’s one of our favorite places to play (there is currently Tupperware under my coffee table and in my slippers). After your toddler has thrown your Tupperware about do you wash it or just throw it back in the cupboard? I won’t lie I have just been throwing it back in, I would be buying dish soap everyday if I washed them every time we played with them. We also discovered the garbage cans, so if you come over and can’t find one, check under the bathroom sinks or on top of the toilets 🙂 We love to climb up on anything, dishwasher included! 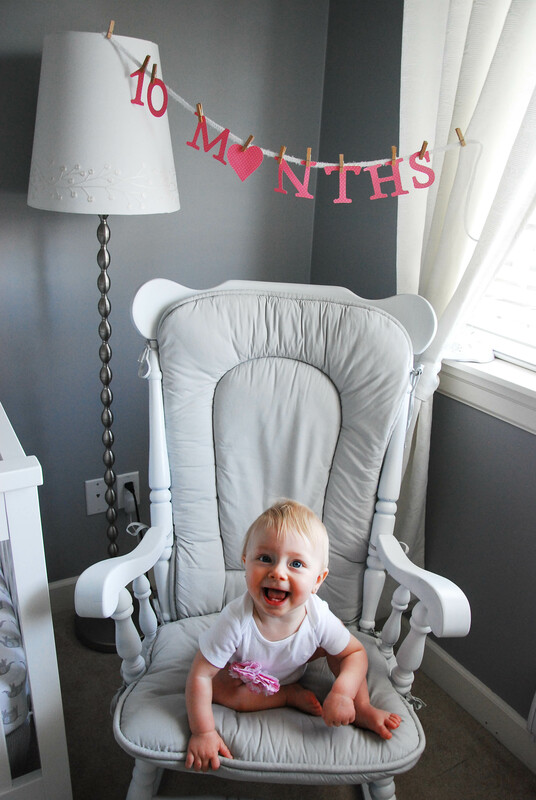 We also started walking around with our stroller this month, we are getting so close to standing on our own. She will let go for a second or two and then quickly sit down when she realizes what shes doing. We have two bottom teeth now, and as of this week are working on what I believe will be a top tooth. Poor monkey has been teething like crazy, lots of drool and lots of chewing on everything. She loves to play with Izzy, the two of them have started playing tug o war with Izzy’s stuffed animals. When I say tug o war, Izzy is usually just trying to take the toy from Hazel and Hazel is flailing her arms and giggling, its pretty cute. We love to feed our self and create a giant mess. Meal times are also Izzy’s favorite time of day as she gets lots of handouts 🙂 I can’t wait to see what new things she discovers this month.